Over the past several months, the federal government and university leaders have made it clear in public statements that equity and inclusion must become top priorities for the higher education sector – particularly where it concerns the recruitment and retention of international and Indigenous students, and equitable hiring practices for faculty. The Society of Teaching and Learning in Higher Education, or STLHE, tapped into this growing sense of urgency regarding equity and inclusion at its 37th annual conference in Halifax last week. Brad Wuetherick kicks off STLHE 2017 in Halifax. Photo courtesy of Jay Wilson. 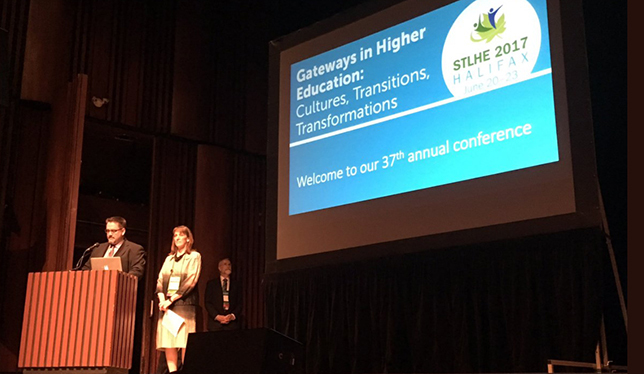 “We’re passing through so many gateways and thresholds as we face the challenges of the 21st century,” said STLHE president Robert Lapp during opening remarks Wednesday morning. “The STLHE itself is a kind of gateway … [that] intentionally breaks down barriers” to facilitate collaboration and connections. Session tracks on Indigenization, internationalization and learner-centred course design addressed many of these concerns, but nearly all tracks – including assessment, experiential learning and supporting faculty – touched on issues around teaching and working in increasingly diverse communities. Specific presentations, for example, examined the negative experiences of LGBTQ faculty and racialized faculty on Canadian campuses, the bridging of Indigenous and Western knowledge systems, and understanding the needs of Indigenous students. “There were practical sessions to enrich teaching and student services [in these areas] but also sessions that spoke deeply about the history of diversity and inclusivity in Canada,” said Dr. McSweeney, who is an educational developer at Dalhousie’s Centre for Teaching and Learning. This year, STLHE has also committed to improving the number of French and bilingual services it offers members. At the group’s annual general meeting on Thursday, its board of directors acknowledged that it had secured new funds for translation in both official languages and had improved the ratio of French-language content to English-language content in STLHE publications and conference sessions. This year, six sessions were presented in French out of 127 workshops and 145 research papers. University Affairs was a sponsor of the STLHE conference.